Brown Sugar Cut-Out Cookies a delicious change from the classic Sugar Cookie, this is a soft cookie with a little crunch. The perfect Christmas Cookie addition. I love the time of the year and making Christmas Cookies. I especially love working with dough, any kind of dough, Sweet Dough, Cookie Dough and especially Cut-Out dough. The other day I was going through my Mom’s Christmas Cookie Recipes, looking to see if there was anything interesting that I had missed. And of course there was, because that is when I found these Brown Sugar Cut-Out Cookies. My youngest daughter was having an end of school Christmas Holiday Break Party, so I thought these Brown Sugar Cookies would be perfect. 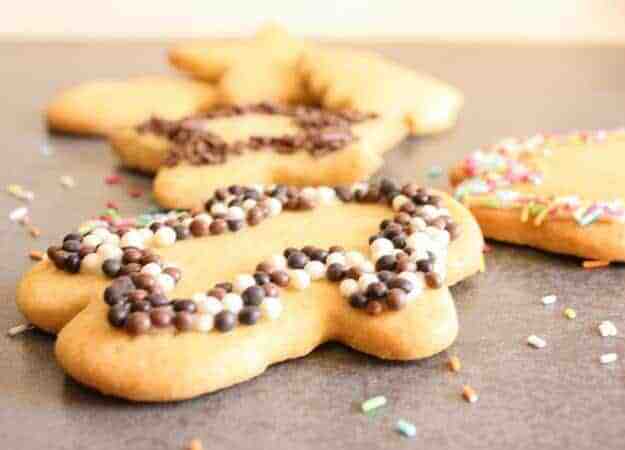 I have been making these Classic Sugar Cookie for as long as I can remember for both of my daughters. Whenever there was a Christmas Party. My daughter’s teacher would even request them and not always at Christmas Time. But this time, since I really like brown sugar I decided to change it up a bit. These are the perfect Brown Sugar Cut-Out Cookies, the dough is easy, and rolls and cuts perfectly. For someone like me who is not the best decorator in the world. 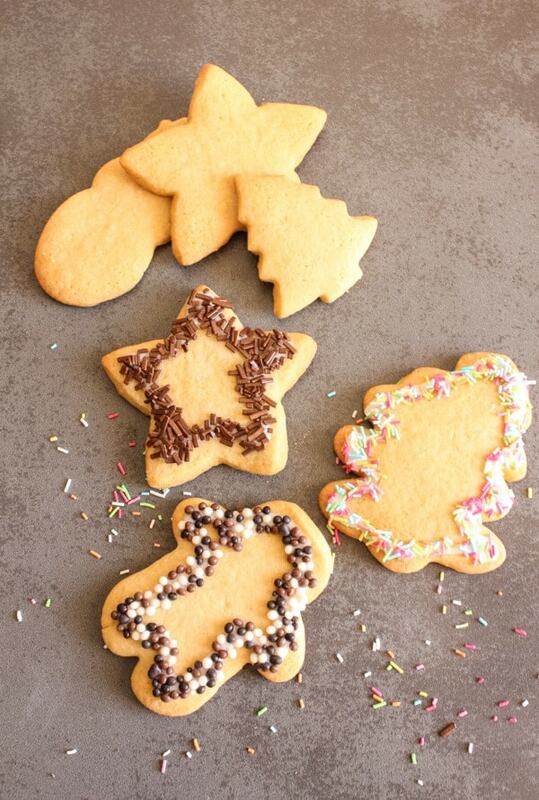 Easy decorations with sprinkles and extra mini chocolate balls make a cookie look really cute. You could even get the kids to do the decorating part, they would love it. Just make sure that your icing is really really thick, so that it doesn’t drip off the cookie and take the sprinkles with it, you want the sprinkles to stick. I made these Cookies pretty big, and I got 22 cookies out of the dough. So if you are looking for a fast and easy last-minute cookie, I think you will be quite pleased with these Brown Sugar Cut-Out Cookies. Enjoy and Happy Baking! 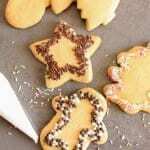 Christmas Brown Sugar Cut-Out Cookies, easy delicious cut out cookie dough recipe, a soft cookie with a little crunch. One of my Mom's best recipes. In a medium bowl cream butter and sugar, add egg and vanilla continue beating until light and fluffy. In a medium bowl whisk together flour, baking powder and salt, add to cream mixture alternately with milk. Wrap the dough in plastic and refrigerate at least an hour (or even overnight). 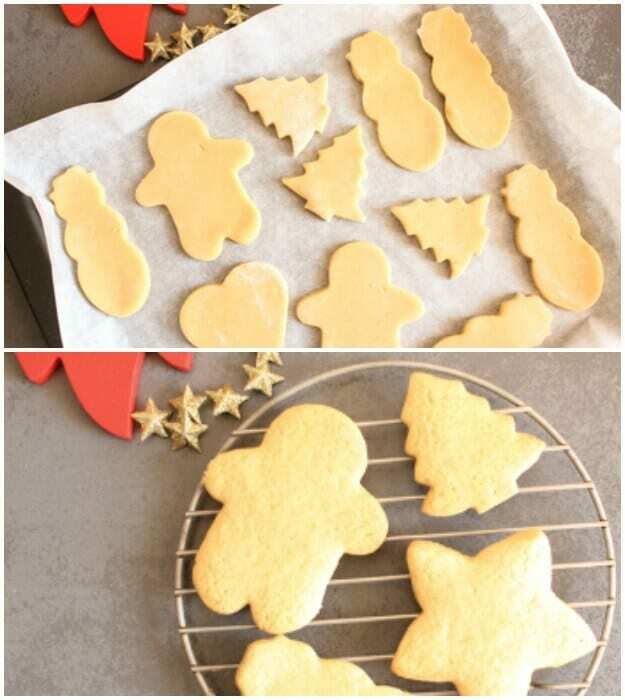 Line cookie sheets with parchment paper, roll out dough to 1/8 inch thickness (or a little thicker if desired), cut out with cookie cutters, place on cookie sheets. Bake approximately 8-12 minutes or until slightly browned. Let cool before icing. Enjoy! 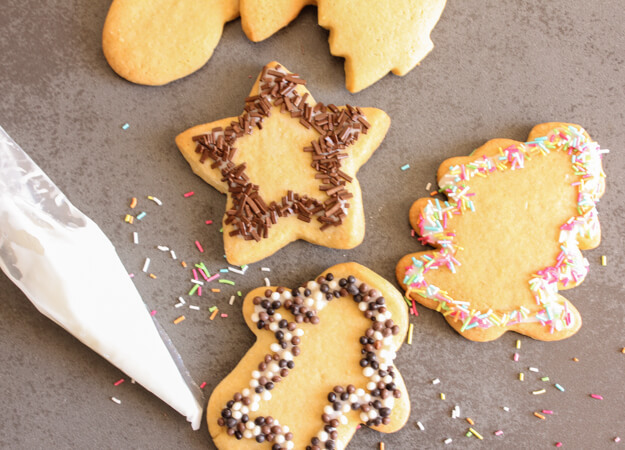 In a small bowl mix together powdered sugar and vanilla gradually add milk (a little at a time, 1 tablespoon might be too much, because you want it really thick), place in pastry bag and draw an outline on the cookie, top with sprinkles. (I placed the cookie on a plastic plate before sprinkling so I didn't have sprinkles everywhere). I added 1/4 tsp each cinnamon and nutmeg. Great recipe and delicious cookie. Thank you for this recipe! Hi Julie, thanks, good idea and glad you liked them. Have a wonderful Christmas. Love brown sugar as well, never have ran across a recipe for brown sugar cut out cookies. So, of course I MUST try them!Pinned them also. Betting the dough is yummy too. Thanks and Happy Holidays!